Amazingly, multiple listings have appeared on eBay for Super Smash Bros. 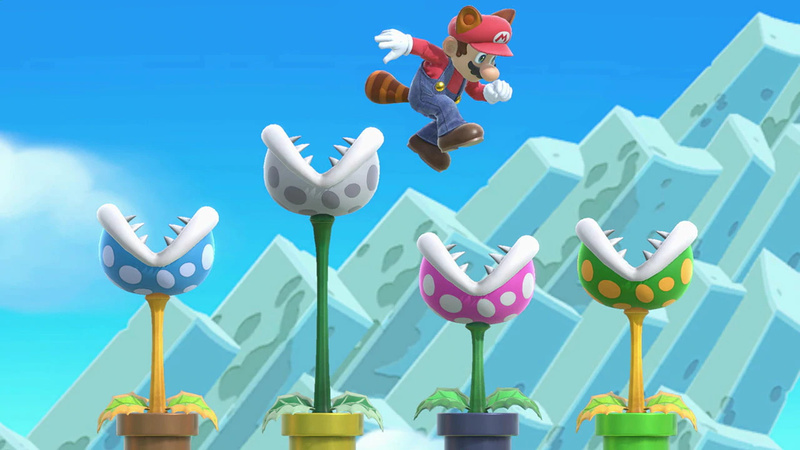 Ultimate Piranha Plant DLC codes, with prices being set at frankly ridiculous amounts. After launching as a free character for players who had purchased the full Smash Bros. game before 31st January, Piranha Plant has now become available to purchase directly from the Nintendo eShop for £4.49 / $4.99. 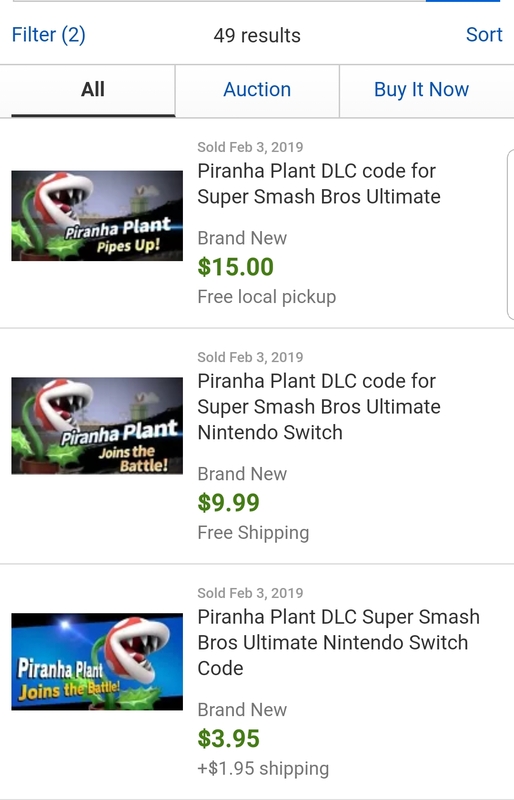 Despite this, some customers who grabbed the game early, and therefore have access to a - presumably unwanted - Piranha Plant code, are trying to sell the product on for up to six times its official price. A quick search for the item on eBay brings up multiple results, with codes being offered from around the $5 mark, right up to the likes of $25 and $30. The $30 listing shown below is actually a 'Buy It Now' price, with the seller generously opening up an auction starting at just $11.50. How kind! We can only assume that these sellers believe the character was exclusive to that time frame and are hoping to cash in on their early purchase; it seems completely bizarre to try and sell a digital product for more than its official - and much safer - option readily available via Nintendo's own store. As is probably obvious at this point, make sure to snag your DLC code from Nintendo's eShop if you're looking to buy. If I were sent an actual card with a code on it, like those nifty eShop cards, I'd buy one. The funny part is that their code doesn't work anymore. @Blizzia It's supposed to work until June, I believe. You had until January 31st to register the game. Unfortunately there is always some idiot that buys these things without searching any information. Oh, thank god, finally a price fitting for such a majestic character. Lol, with people charging ~$30 for this, you’d be better off buying the Fighters Pass, if PP was exclusive to early buyers. Would you rather have 5 fighters for $25 or one fighter for ~$30? But he’s NOT exclusive to early buyers, making this incredibly stupid. I've got a bridge in Brooklyn for sale. Will take any reasonable offer. Please call 1-800-555-3957. Also the code only works with the account for which it was generated, I registered smash on one of my accounts and tried to redeem the code on another and it did not work. Has to be the same acount, so doubly pointless. This is too funny. Don't they know it only works with the original account? But... But why? Some poor naive soul is gonna fall for this. Probably someone's grandmother or something. Shame on the sellers. That is probably the kind of thing they are going for. eBay - You will never find a more wretched hive of scum and villainy. im pretty sure piranha plant deserves to be 60 dollars, eBay. Why those dirty mothe.... hang on a minute... who cares whether someone's trying to re-sell DLC or not? Good luck to them. Even if I didn't get Piranha Plant for free, I would just get it on the eShop. But thanks for playing, eBay sellers. You want to know the real kicker, check off "sold items" on the listings. I'm not sure which is stranger; charging over $9 for it, being brought yesterday, or one of them charging for shipping. It's a scam, you'll buy the code then find out it doesn't work and then you had to pay for it again when you find out you could had easily bought the plant in the eShop instead. The sad thing is that some poor soul is going to pick one of these up. Some of these sellers are either clueless themselves or else don't care that they're cheating people. Lol, the corrupted save-file glitch comes for free with it. But seriously, I won't use Piranha plant untill they have fixed that glitch! @ultraraichu glad someone else looked at the sold listings. I saw some that offered "Local Pickup".......not predatory at all. Or maybe they just want to laugh in your face after purchasing something for triple the price. @Henmii that glitch only effects digital users not physical copy ones. Omg why it's $5.00 on the eShop ! Are you sure? I thought physical owners had the same problem. Anyway, I hope Nintendo solves this soon! This is just too funny....baaaaha. You can buy from eShop already if not sooner then later. why would you even buy him for $30!? who would need to do this. you can easily buy him for $4.99 on the eshop.